Many websites ask for your location to offer better services or request to show desktop notifications to keep you updated. These prompts will stop you from navigating the website and won’t go away until you hit the “Allow” or “Deny” button. If you are tired of seeing these prompts, you can easily disable them in your browser. In this post, I will show you how to disable location tracking and desktop notifications in Chrome, Firefox, Opera, Safari and Microsoft Edge. After disabling these features, use the Manage exceptions (if available) button to manually allow these features on the required websites. Note: Do remember that location tracking and desktop notification features can be very handy. For example, you should enable location tracking for any Maps website (like Google Maps) to get precise results, and enabling desktop notification ensures you are immediately updated on important messages; such as emails. In Chrome, click on the Main menu at the top-right corner and select Settings from it. In the settings, scroll down and click on Show advanced settings, and then click on Content settings under the Privacy heading. Scroll down in this menu and you’ll see Location and Notifications sections. 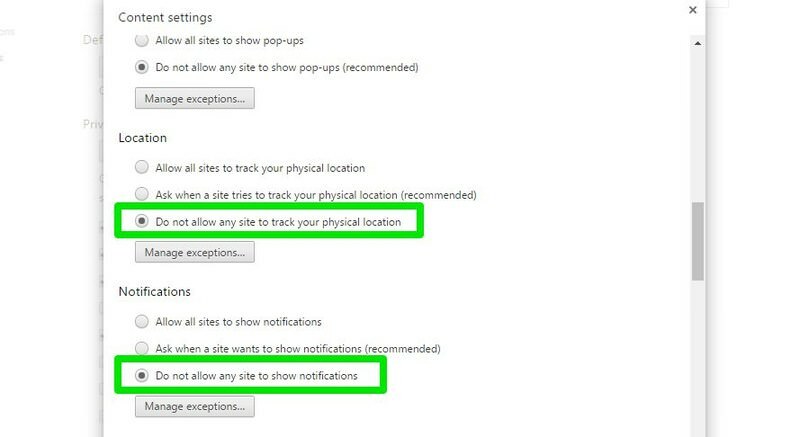 Select “Do not allow any site to track your physical location” in the Location section, and select “Do not allow any site to show notifications” in the Notifications section. You should see a button of Manage exceptions below each of the options. 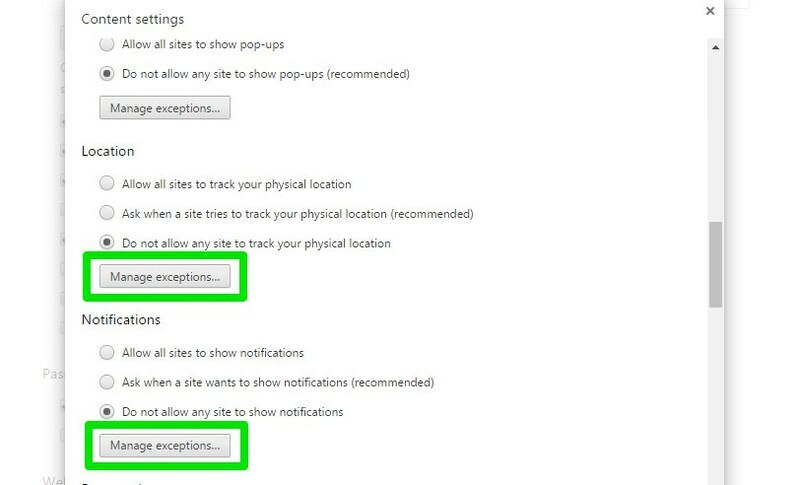 Click on it to allow these features on specific websites, or block them on websites that are already allowed to track location or show desktop notifications. 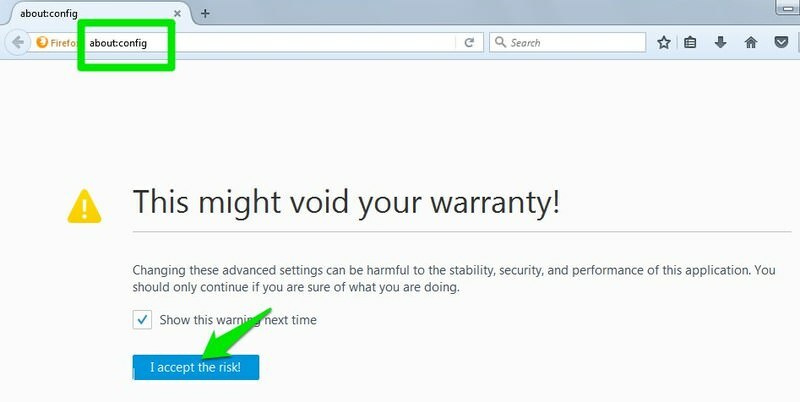 Firefox doesn’t offer any way to disable location tracking and desktop notifications from its main options. However, you can still completely disable these options from its hidden experimental settings. To access hidden settings in Firefox, type about:config in the address bar and hit enter. Click on “I accept the risk!” button on the next page and you will see a big list of tweakable features. To stop location tracking prompts, type geo.enabled in the above search bar and double-click on geo.enabled option to set it to False. This will stop websites from prompting you to enable location tracking. To stop desktop notification prompts, type dom.webnotifications.enabled in the search bar and double-click on dom.webnotifications.enabled to set it to False. Now no website will ask to show desktop notifications. Unfortunately, Firefox doesn’t provide any options to manage or allow both of these features for any websites. Once you disable these features, you won’t be able to use them at all. In Opera, click on the Menu button at the top-left corner and select Settings (or press Alt + P ). Here choose Websites from the left-hand menu and scroll down until you see Location and Notifications section. To disable location prompts, simply select “Do not allow any site to track my physical location” in the Location section. And to disable desktop notifications prompt, select “Do not allow any site to show desktop notifications” in the Notifications section. Similar to Chrome, Opera also has Manage exceptions button under each of these options. Simply click on it to allow or block these features for specific websites. Internet Explorer doesn’t support desktop notification by default, so you won’t have to worry about those prompts. However, you will still see location tracking prompts and here’s how to disable them. In Internet Explorer, click on the Gear icon at the top-right corner and select Internet options from it. Here move to the Privacy tab and check the checkbox next to “Never allow websites to request your physical location”. This will prevent websites from showing location tracking prompts. Internet Explorer doesn’t make it easy to manage exceptions, but you can still do it. The browser will not block location tracking for websites that are already allowed to track. So you can allow location tracking on the required websites and then disable it in the browser. 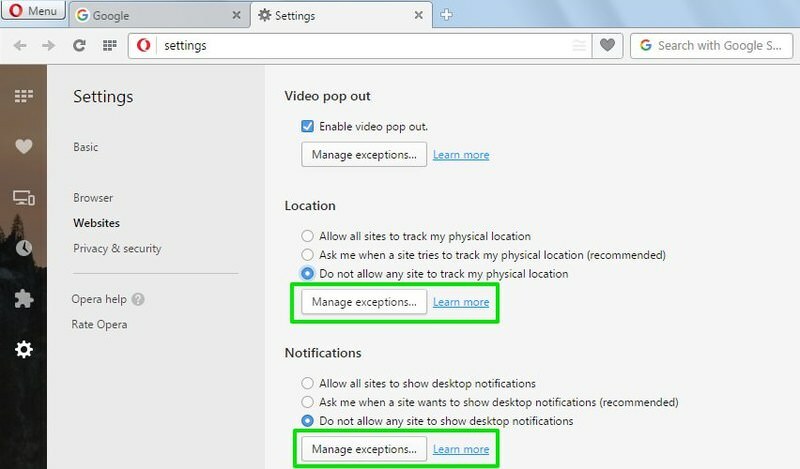 If you need to disable location tracking for all the websites again, then perform the steps mentioned above and then click on the Clear sites button next to the “Never allow websites to request your physical location” button. This will clear all the sites that were previously allowed to track location. Microsoft Edge does support location tracking and desktop notifications, but it doesn’t offer any convenient way to disable them. To disable location tracking requests, you will have to disable location tracking in the Windows 10 settings like you do it for other Windows 10 universal apps. Go to Settings from the start menu and click on the Privacy option. 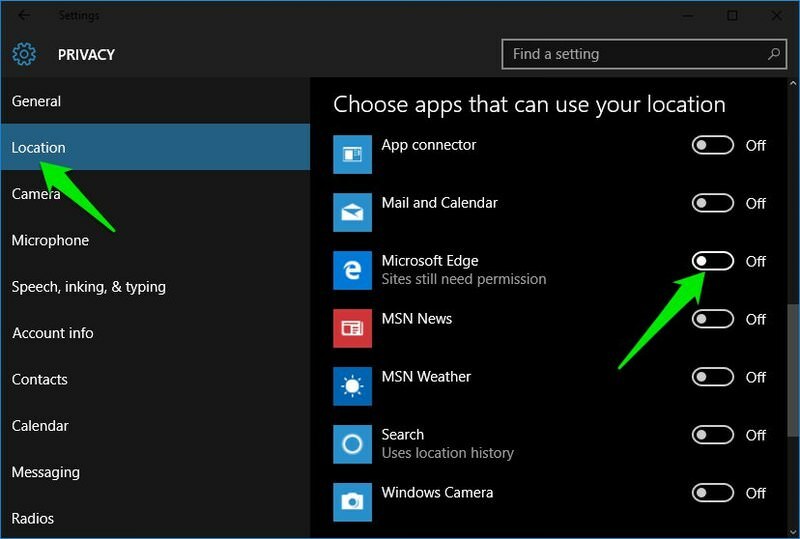 Here select Location section from the left menu and then scroll down until you see all the Windows universal apps listed. 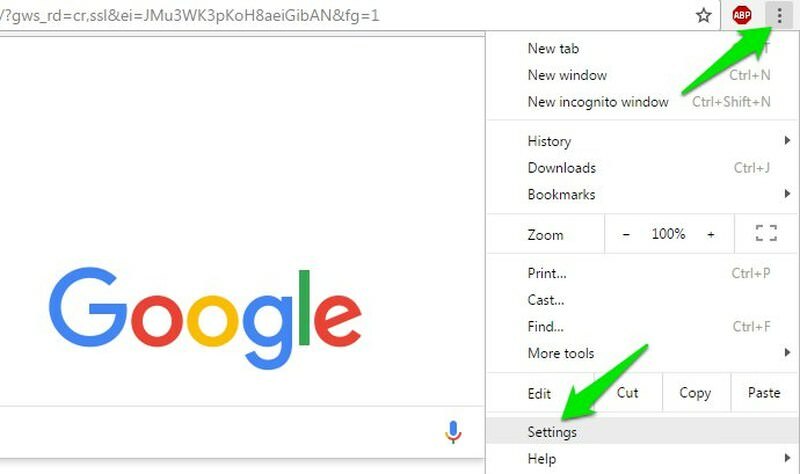 Simply click on the toggle button next to Microsoft Edge and switch it off. This will disable location tracking prompt in Edge and will stop all the websites from tracking your location. To disable desktop notification prompts in Microsoft Edge, there is, unfortunately, no option. You will have to deal with them at least once on every supported website and Edge will remember your preferences. Similarly to Chrome and Opera, Safari also makes it easy to disable location and desktop notification prompts. Although you may have a little trouble managing location tracking similar to Internet Explorer. From the Safari menu, go to Preferences and then move to Privacy tab. Here, just select Deny without prompting in the “Website use of location services” section to disable location tracking prompts. Although there are no options to manage exceptions, but similar to Internet Explorer; Safari remembers the websites for which location tracking is not allowed. You can allow location tracking on required websites and then disable location tracking, and Safari will not block location tracking for those websites. Go to the Preferences again and click on the Notifications tab. Here uncheck the checkbox next to “Allow websites to ask for permission to send push notifications” to stop websites from prompting you to enable desktop notification. 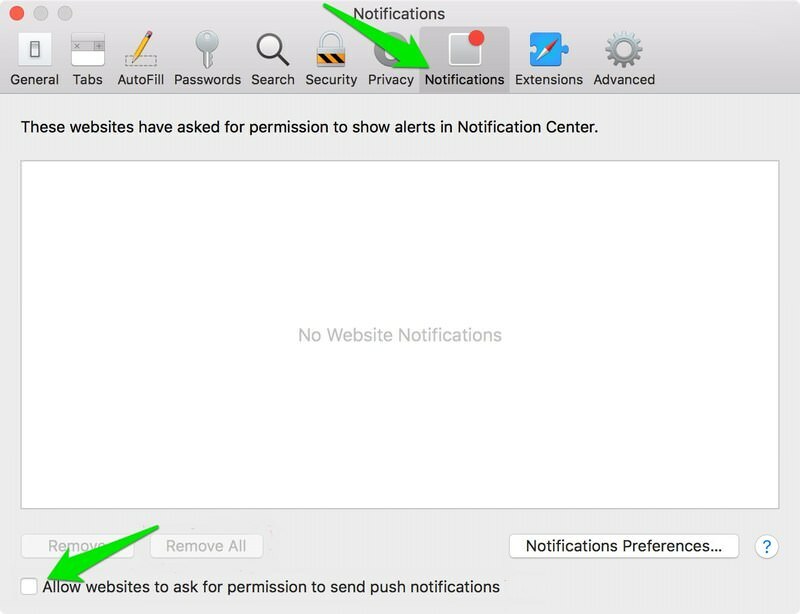 In the middle you will see all the websites with permissions to provide desktop notifications, you can easily manage them here. Location and desktop notifications prompts can be really annoying, but at least you can disable them in most cases. Chrome and Opera are the only browsers that make it very easy to both disable and manage these features. Although you can still disable these features if you don’t mind going through few extra steps. 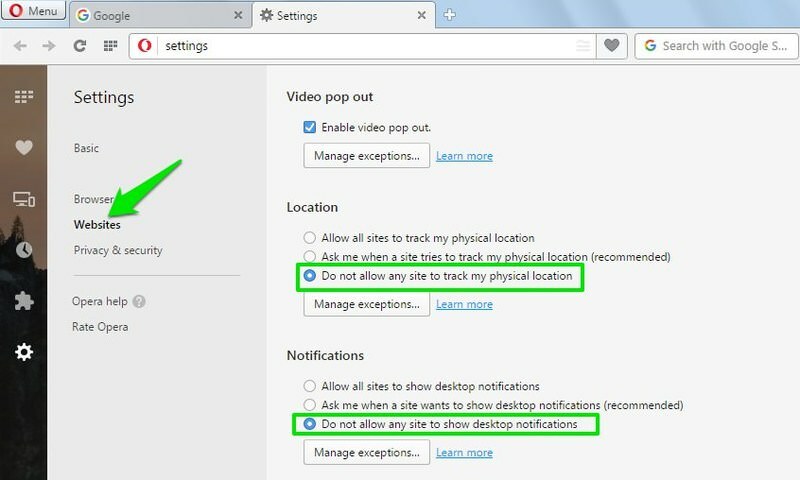 The post How to Disable Website Location Tracking & Desktop Notifications appeared first on Hongkiat.